A simple level design map I made. Calvin, Renegade and EMK-20218 like this. - Level name isn't present in the title card because I don't want to reveal the level's real name yet. - Background deformation has some problems related to the horizontal scrolling buffer, but I'll fix it. - Time counter and "time over" doesn't exist anymore in the HUD, although the Time Bonus still exist and you'll see it when you complete the level. - Lives counter was moved upside to free up space in the bottom of the screen. - Footage isn't of the full level because I don't want to spoil too much of their details. - Credits are in the video description on Youtube. - Object Placement is in very primary phase, so this is the reason of which the level doesn't yet have too much enemy variety. Dj. Joker 27, ProjectFM, CreepyMystery and 6 others like this. Wow, something about this just really gives it more of a fangame vibe now. With all the additional objects, frames in Sonic's animations, HUD, and sound effects, I had to double check that this was still a hack I was looking at. Still don't know where to go when I want to find Sonic hacks, but I can always trust SHC. More work going toward Back to South Island/Cthulhu's island. I did have plans for "fog", but I have no idea how to code/implement that. AkumaYin, Iso Kilo, EMK-20218 and 3 others like this. You could make the fog part of the level's background on the high plane, like SLZ or, at least, that's what I think SLZ does. It could part of the foreground on the high plane. I'll have to look at it later. Surprisingly, after a year of hacking, I never edited any levels past SYZ. I guess you could also make it a palette cycle (Like what Pacca did for her port of Mania OOZ's gimmick) But probably wouldn't be the exact effect you want. Well, hope some of those tips were useful! Nice tree, by the way. These 2 screenshots introduce new dark-forest themed zone, made of GHZ. It also introduce some demon badniks from this zone, red hearts that came instead of rings and serving for health restoring, new hud font and one of bosses of hack. Dj. Joker 27, Angel X, EMK-20218 and 14 others like this. A beautiful romantic night sky. Edit: Dang, forgot to put in a picture of a new pallet for a level. Next time, next time. Angel X, ProjectFM and Calvin like this. The lava is a tad too saturated, and there are too many stars close together. If you're going to add more, spread them out, and add a bit more variety in the star types. Renegade and AkumaYin like this. So, something more like this? It's hard to get the right colours for that lava, if this isn't that good I'll keep working on it. What you did with the stars is the opposite of what Pineapple Arse asked. The stars should be spread out in a sort of random way. Bunching them together doesn't look natural. I think the lava looks a lot better. One of my pet peeves is when white is used in shading. There can be a right use for it, but pure white generally does not look good in a night time setting. The stars getting bunched together was actually because of scrolling. (I figured it was fine since Star Light Zone did it.) The reason I took the photo there instead of the start of the level is because there isn't much view of the BG at the beginning. Anyway, thanks for telling me, because I did go back and adjusted the stars a bit more, so all I need now is a bit more variety. So, I decided to upload a video of me going through Emerald Hill Zone Act 1 and 2, and I'd appreciate your thoughts on it, if possible. These layouts look a bit claustrophobic, and have close resemblance to many other EHZ layout hacks. While this does look like one of the better ones, and I do like the colour palette and level design here, at the end of the day, it mostly resembles what other people have done as well. I've seen the windows before, but the pole things every here and there are an interesting touch. It's pretty good, but I feel like it'd stand out a lot better if you used tiles from other Zones as well, or even made your own. Jdpense, maple_t and Iso Kilo like this. The level design shouldn't cause Sonic to run into walls because it breaks the flow. If you are going to put a wall in front of Sonic, then you should be in a slower section or have Sonic in motion (such as bouncing on an upward spring. That palettes are nice, though. Jdpense and maple_t like this. That palettes are nice, though. Huh. Well it's nice to know my palettes are a fan-favourite. I'd try to make new tiles, and just generally more artwork, but I'm not exactly the best artist out there, when it comes to this sort of stuff. Thanks though, this is exactly what I needed to know. Personally, I'm not a fan of the palette. Sunsets are generic and piss me off. All you need to do is bump up the red value a bit. Sure I made a video showing Encore GHZ (or at least a half-assed one) but seeing the colors annoyed me more than regular GHZ. I'd much rather see some sort of winter version during nighttime. But that's my personal preference, it's your hack, so do as you please. Personally, I'm not a fan of the palette. Sunsets are generic and piss me off. 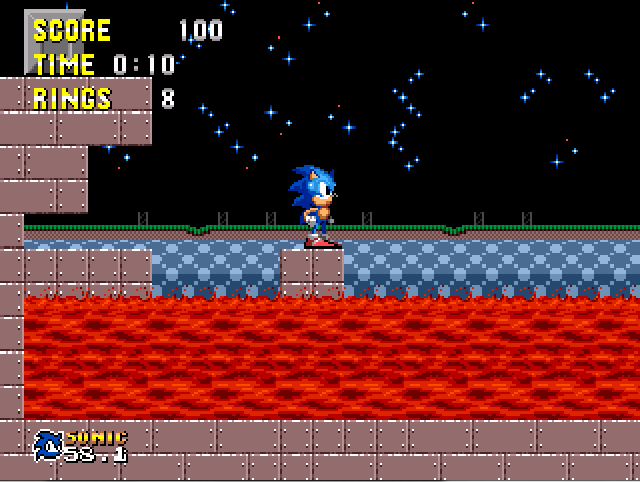 Actually, I plan on having Emerald Hill load different tiles and chunks and a different palette in the second act, so it goes from above ground in act 1, with a day palette, then in the second act it goes underground and back above ground, to a sunset palette, with a new background and a different song. Hell, if I'm feeling like I want a challenge, I might even make the palette a cycling palette that goes from sunset to nighttime. The only issue I'll have is making the object itself, and its art. You could start the zip line by using the crane object and modifying it so it has X velocity ($10(a0)) instead of Y velocity ($10(a0)). Then you can check if the object reaches a certain point and have it release Sonic and stop itself when it does. Calvin, Renegade, maple_t and 2 others like this. Apologies for the large screenshots, but I have introduced dynamic palettes into acts 1-3. Dj. Joker 27, Angel X, A-S-H and 7 others like this.